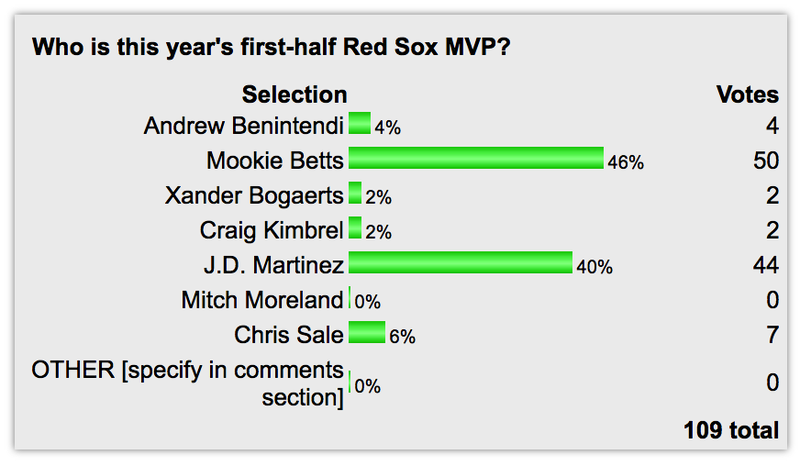 The latest results of our most recent FenwayNation Poll show that readers now view Mookie Betts as the top choice for first-half Red Sox MVP. As the chart shows, the Boston All-Star right-fielder now garners 46% of the vote, followed by J.D. Martinez at 40%. Distantly trailing these two is Chris Sale (6%), followed by Andrew Benintendi (4%), Xander Bogaerts (2%) and Craig Kimbrel (2%). No voters have yet selected Mitch Moreland, or any other write-in choices. You can still vote in this poll HERE.